Just listened to this Podcast of a conversation between Brian Eno and Steven Johnson, roughly organized around Johnson's book, The Invention of Air, but talking about environments that support innovation, how ideas can be made, and what conditions are in place when this happens. Very interesting. Eno and Johnson talk about how Londoners went from drinking wine and beer all day to drinking coffee and tea in the 1760s, and the explosion of coffee houses that provided gathering places for intellectual discussion. They pose the question of whether this fueled the innovations of the Enlightenment - hubs where different disciplines connect combined with an atmosphere of amateurism being characteristic of environments that foster innovation. Johnson compares this open sharing of ideas and cross-disciplinary exploration to the atmosphere in the Silicon Valley. Eno talks about the period in the 60s in England when art schools were where the interesting music was being made - the idea of crossing disciplinary boundaries being essential for creativity - comparing that to the early days of Silicon Valley, when folks coming from a wide variety of disciplines had a hand in creating the personal computer. The idea of randomness being important to innovation, and that when you have experts from only one field involved, that essential randomness is eliminated. 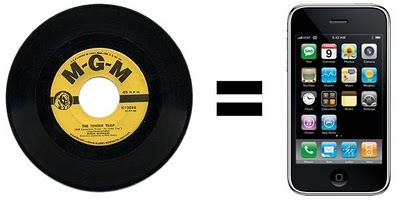 He also discusses platforms that inspire creativity, comparing the 45 rpm record to iPhone apps. Rock music being very easy to play, combined with the 45 rpm record being easy to record and distribute, plus a thirsty dissemination medium, radio, always looking for something new to play. Johnson and Eno compare this to the current open platform web environment, and especially the iPhone app platform.